In English literature of the Elizabethan era, elves became conflated with the fairies of Romance culture, so that the two terms began to be used interchangeably. German Romanticist writers were influenced by this notion of the 'elf', and reimported the English word elf in that context into the German language. In Scandinavia, probably through a process of euphemism, elves often came to be conflated with the beings called the huldra or huldufólk. Meanwhile, German folklore has tended to see the conflation of elves with dwarfs. Germanic *ɑlβi-z~*ɑlβɑ-z is generally agreed to be cognate with the Latin albus ('(matt) white'), Old Irish ailbhín (‘flock’); Albanian elb (‘barley’); and Germanic words for ‘swan’ such as Modern Icelandic álpt. These all come from an Indo-European base *albh-, and seem to be connected by whiteness. The Germanic word presumably originally meant 'white person', perhaps as a euphemism. 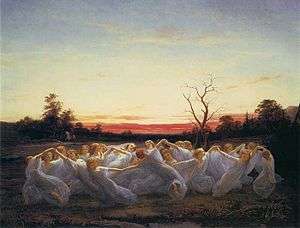 Jakob Grimm thought that whiteness implied positive moral connotations, and, noting Snorri Sturluson's ljósálfar, suggested that elves were divinities of light. This is not necessarily the case, however. For example, Alaric Hall, noting that the cognates suggest matt white or soft white, has instead tentatively suggested that later evidence associating both elves and whiteness with beauty may indicate that it was this beauty that gave elves their name. Compare descriptions such as ‘swan white’ to describe the beauty of fair complexion. Norse cultural values view masculinity as an ideal of beauty, which the Alfr personifies. For example, the Norse Eddas similarly celebrate the male beauty of Baldr. Icelandic Sagas celebrate the beauty of the cliff giants (bergrisi), and certain warrior kings that descend from them. 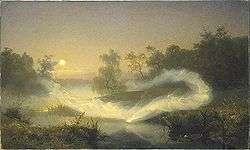 Modern Scandinavian folklore celebrates the male beauty of the Fossegrim and the Huldrekarl/Huldrekall, nature spirits comparable to nymphs, but masculine men. By contrast, British cultural values tend to downplay male beauty and only emphasize femininity as an ideal of beauty. 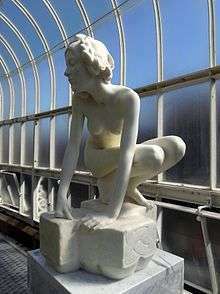 For example, angels are unambiguously masculine in ancient biblical texts, yet because of their beauty, modern British artists often depict angels as feminine. Ultimately, beauty and luminosity are identical. In the Norse Eddas, the radiant beauty of Baldr is the light of the daylight itself. Likewise, in medieval British poetry, the supernatural beauty of biblical Judith is described as ‘elf shining’ (ælfscinu), a magical beauty that shines an aura of light. Personal names provide the only evidence for elf in Gothic, which must have had the word *albs (plural *albeis). The most famous such name is Alboin. Old English names in elf- include the cognate of Alboin Ælfwine ("elf-friend", m.), Ælfric ("elf-powerful", m.), Ælfweard (m.) and Ælfwaru (f.) ("elf-guardian"). The only widespread survivor of these in modern English is Alfred (Old English Ælfrēd, "elf-advice"). German examples are Alberich, Alphart and Alphere (father of Walter of Aquitaine) and Icelandic examples include Álfhildur. It is generally agreed that these names indicate that elves were positively regarded in early Germanic culture. Other words for supernatural beings in personal names almost all denote pagan gods, suggesting that elves were in a similar category of beings. In later Old Icelandic, alfr ("elf") and the personal name which in Common Germanic had been *Aþa(l)wulfaz both coincidentally became álfr~Álfr. This seems to have led people to associate legendary heroes called Álfr with the elves. Because of elves' association with illness, in the second half of the twentieth century, most scholars imagined that elves in the Anglo-Saxon tradition were small, invisible, demonic beings, causing illness with arrows. Scholars, but not the primary texts, labelled the illnesses elves caused as "elf-shot" This was encouraged by the idea that "elf-shot" is depicted in the Eadwine Psalter, in an image which became well known in this connection. 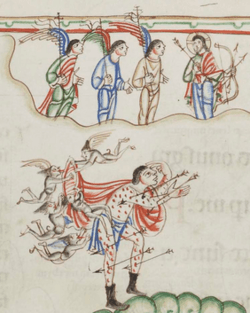 However, this is now thought to be a misunderstanding: the image proves to be a conventional illustration of God's arrows and of Christian demons. But there is good evidence that elves were associated with the succuba-like mære and could cause illness, recent scholarship suggests Anglo-Saxon elves, like elves in later evidence from Britain and Scandinavia or the Irish Aos Sí, were like people. Like words for gods and men, the word elf is used in personal names where words for monsters and demons are not. 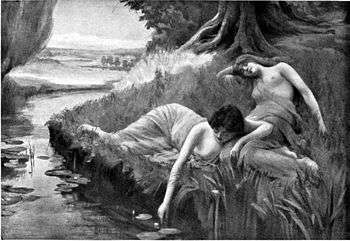 Just as álfar are associated with Æsir in Old Norse, Wið færstice associates elves with ēse; whatever this word meant by the tenth century, etymologically it denoted pagan gods. In Old English, the plural ylfe (attested in Beowulf) is grammatically an ethnonym (a word for an ethnic group). For a long time, views about elves in Old Norse mythology were defined by Snorri Sturluson's Prose Edda, which talks about svartálfar, dökkálfar and ljósálfar. However, these words are only attested in the Prose Edda and texts based on it, and it is now agreed that they reflect traditions of dwarves, demons, and angels, partly showing Snorri's 'paganisation' of a Christian cosmology learned from the Elucidarius. One possible semantic field diagram of words for sentient beings in Old Norse, showing a Venn diagram their relationships (Hall 2009, 208 fig. 1). A kenning for the sun, álfröðull, is of uncertain meaning but is to some suggestive of a close link between the elves' and the sun. William Shakespeare also imagined elves as little people. He apparently considered elves and fairies to be the same race. In a speech in Romeo and Juliet (1592) an 'elf-lock' (tangled hair) is not caused by an elf as such, but Queen Mab, who is referred to as 'the fairies' midwife'. In A Midsummer Night's Dream, the elves are almost as small as insects. The influence of Shakespeare and Michael Drayton made the use of elf and fairy for very small beings the norm, and had a lasting effect seen in fairy tales about elves collected in the modern period. ↑ Lass 1994, p. 205; Lindow 2002, p. 110; Hall 2007. ↑ 2006, 230-31; cf. Shippey 2005; Hall 2007, 16-17; Gunnell 2007. 1 2 Hall 2007, 32-33. ↑ Hall 2007, 75-88, 157-66. ↑ Hall 2007, 5, 176-77. ↑ Kuhn, Adalbert (1855). Die sprachvergleichung und die urgeschichte der indogermanischen völker. Zeitschrift für vergleichende Sprachforschung. 4. , "Zu diesen ṛbhu, alba.. stellt sich nun aber entschieden das ahd. alp, ags. älf, altn . âlfr"
↑ in K. Z., p.110, Schrader, Otto (1890). Prehistoric Antiquities of the Aryan Peoples. Frank Byron Jevons (tr.). Charles Griffin & Company,. p. 163. .
↑ Hall 2007, 54-55 fn. 1. ↑ Paul, Hermann (1900). Grundriss der germanischen philologie unter mitwirkung. K. J. Trübner. p. 268. ↑ Althof, Hermann, ed. (1902). Das Waltharilied. Dieterich. p. 114. 1 2 3 Hall 2007, 55-62. ↑ De Vreis 1962, s.v. Álfr. ↑ The seminal statements of this theme are Jolly 1996 and Shippey 2005. 1 2 Shippey 2005, 180-81; Hall 2007, 23-26; Gunnell 2007, 127-28; Tolley 2009, I 220. ↑ Hall 2007, 69-74, 106 n. 48 and 122 on English evidence; Hall 2007, 98 fn 10 and Schulz 2000, 62–85 on German evidence; Haukur Þorgeirsson 2011, 54-58 on Icelandic evidence. ↑ e.g. Hall 2007, 172-75. ↑ Shippey 2005, 161-68; Alver and Selberg 1987. ↑ Hall 2007, 75; Shippey 2005, 174, 185-86. ↑ J. H. G. Grattan and Charles Singer, Anglo-Saxon Magic and Medicine Illustrated Specially from the Semi-Pagan Text ‘Lacnunga’, Publications of the Wellcome Historical Medical Museum, New Series, 3 (London: Oxford University Press, 1952), frontispiece. ↑ Hall 2007, 124-26, 128-29, 136--37, 156. ↑ Shippey 2005, 168-76; Hall 2007, esp. 172-75. ↑ Huld 1998; Hall 2007, 62-63; Tolley 2009, I 209. ↑ Tolley 2009, I 220. ↑ Hall 2007, 119-56; Tolley 2009, I 221. ↑ Hall 2007, 157-66; Shippey 2005, 172-76. ↑ Shippey 2005, 175-76; Hall 2007, 130-48. ↑ Hall 2007, 88-89, 141; Green 2003; Hall 2006. ↑ Purkiss 2000, 85-115; Henderson and Cowan 2001; Hall 2005. ↑ Henderson and Cowan 2001; Hall 2005. ↑ Carlyle, Alexander, ed. (1788). "An Ode on the Popular Superstitions of the Highlands. Written by the late William Collins". Transactions of the Royal Society of Edinburgh. i: 68. , stanza II. 1749 date of composition is given on p. 63. ↑ Hall 2007, 34-39; Haukur Þorgeirsson 2011, 49-50. ↑ Hall 2007, 31-34, 42, 47-53. ↑ Simek 2010; Hall 27, 35-37; Frog and Roper 2011. ↑ Tolley 2009, I 210-17. ↑ Motz 1973, p. 99; Hall 2004, p. 40. ↑ Ármann Jakobsson 2006; Hall 2007, 39-47. ↑ Haukur Þorgeirsson 2011, 50-52. ↑ Ármann Jakobsson 2006, 231. ↑ Ármann Jakobsson 2006, 231; Tolley 2009, I 217-18. ↑ Ármann Jakobsson 2006, 231-32; Hall 2007, 26-27; Tolley 2009, I 218-19. ↑ The Saga of Thorstein, Viking's Son (Old Norse original: Þorsteins saga Víkingssonar). Chapter 1. Archived 25 November 2009 at the Wayback Machine. ↑ Ármann Jakobsson 2006, 232. ↑ Haukur Þorgeirsson 2011, 52-54. ↑ Hall 2007, 132-33; Haukur Þorgeirsson 2011, 54-58. ↑ 'Naturgott oder -dämon, den Faunen der antiken Mythologie gleichgesetzt ... er gilt als gespenstisches, heimtückisches Wesen ... als Nachtmahr spielt er den Frauen mit'; Karg-Gasterstädt and Frings 1968–, s.v. alb. ↑ Edwards 1994, 16-17, at 17. ↑ Motz 1983, esp. 23–66. ↑ Weston, Jessie Laidlay (1903). "The legends of the Wagner drama: studies in mythology and romance". C. Scribner's sons: 144. ↑ Gillespie, George T. (1973). A Catalog of persons named in German heroic literartue. Clarendon Press. p. 3, note 3. , citing Hempel, Heinrich- (1926). Nibelungenstudien: Nibelungenlied, Thidrikssaga und Balladen (snippet). C. Winters universitätsbuchhandlung. pp. 150–. ↑ Keightley 1850, p. 208, citing Grimm says Auberon derives from Alberich by a usual l→u change. ↑ Karg-Gasterstädt and Frings 1968–, s.v. albe; Edward 1994, 17. ↑ Thistelton-Dyer, T.F. The Folk-lore of Plants, 1889. Available online by Project Gutenberg. File retrieved 3-05-07. ↑ Marshall Jones Company (1930). The Mythology of All Races Series, Volume 2 Eddic, Great Britain: Marshall Jones Company, 1930, pp. 221-222. ↑ Lynda Taylor, 'The Cultural Significance of Elves in Northern European Balladry' (Unpublished PhD thesis, University of Leeds, 2014), http://etheses.whiterose.ac.uk/8759/. ↑ "elf-lock", Oxford English Dictionary, OED Online (2 ed. ), Oxford University Press, 1989, retrieved 26 November 2009 ; "Rom. & Jul. I, iv, 90 Elf-locks" is the oldest example of the use of the phrase given by the OED. ↑ Thun, Nils (1969). "The malignant Elves:Notes on Anglo‐Saxon Magic and Germanic Myth". Studia Neophilologica. 41 (2): 378–396. doi:10.1080/00393276908587447. (p.378). ↑ "Die aufnahme des Wortes knüpft an Wielands Übersetzung von Shakespeares Sommernachtstraum 1764 und and Herders Voklslieder 1774 (Werke 25, 42) an; Kluge, Friedrich (1899). Etymologisches Wörterbuch der deutschen Sprache (6th improved and expanded ed.). Strassbourg: K. J. Trübner. p. 93. ↑ Grimm and Grimm 1854–1954, s.v. Elb. 1 2 3 4 5 6 The article Alfkors in Nordisk familjebok (1904). 1 2 Hellström (1990). En Krönika om Åsbro. p. 36. ISBN 91-7194-726-4. ↑ For the Swedish belief in älvor see mainly Schön, Ebbe (1986). "De fagra flickorna på ängen". Älvor, vättar och andra väsen. ISBN 91-29-57688-1. ↑ Keightley 1850, pp. 78–. Chapter: "Scandinavia: Elves"
↑ "Google Maps". Maps.google.com. 1 January 1970. Retrieved 2012-06-14. ↑ "Lilla Rosa och Långa Leda". Svenska folksagor. Stockholm: Almquist & Wiksell Förlag AB. 1984. p. 158. ↑ "Novatoadvance.com, Chasing waterfalls ... and elves". Novatoadvance.com. Retrieved 2012-06-14. ↑ "Icelandreview.com, Iceland Still Believes in Elves and Ghosts". Icelandreview.com. Retrieved 2012-06-14. Grimm, Jacob (1883). "XVII. Wights and Elves". Teutonic mythology. 2. James Steven Stallybrass (tr.). W. Swan Sonnenschein & Allen. pp. 439–517. Grimm (1883). Teutonic mythology. 3. Stallybrass (tr.). pp. 1246ff. 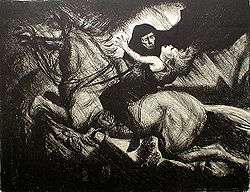 Grimm (1888). "Supplement". Teutonic mythology. 4. Stallybrass (tr.). pp. 1407–1435. Hall, Alaric (2005b). "Getting Shot of Elves: Healing, Witchcraft and Fairies in the Scottish Witchcraft Trials". Folklore. 116 (1): 19–36. doi:10.1080/0015587052000337699. Eprints.whiterose.ac.uk. Huld, Martin E (1998). "On the Heterclitic Declension of Germanic Divinities and the Status of the Vanir". Studia Indogermanica Lodziensia. 2: 136–46. Jolly, Karen Louise (1992). "Magic, Miracle, and Popular Practice in the Early Medieval West: Anglo-Saxon England". In Neusner, Jacob; Frerichs, Ernest S.; Flesher, Paul Virgil McCracken. Religion, Science, and Magic: In Concert and in Conflict. Oxford University Press. p. 172. ISBN 978-0-19-507911-1. Shippey, TA (2004). 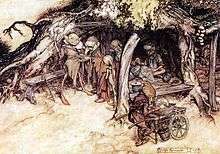 "Light-elves, Dark-elves, and Others: Tolkien's Elvish Problem". Tolkien Studies. 1: 1–15. doi:10.1353/tks.2004.0015.